Tips on Choosing your Immigration Consultant - Gateway to Canada | Canada Immigration Consultancy! When the proposed amendments to modernize the immigration system was approved more than two years ago, it paved the way for an expedited process for Federal Skilled Worker program. Since November 2008, when the first Ministerial Instruction was issued, in only takes about 6-12 months for most Canadian Visa Offices to process visa under the FSW program. Many businessman saw an opportunity and thus, many immigration consulting firms suddenly sprouted like muschrooms. Prior to this, when the processing period took about 5 to 6 years, there aren't many consulting firms out there. Ask for recommendations from people you trust. Talk to several potential advisers before choosing one. o find out how long they have been in business. Discuss what services they will provide and the fee. Get this information in writing. Ask questions. You should be wary of a consultant who refuses to answer your questions. If you are choosing a consultant in Canada, you can also contact the Better Business Bureau before making your choice. They can tell you if any complaints have been raised against immigration consultants, lawyers, and other representatives that operate in Canada. Canadian Immigration Consultancy has been in the industry for more than 2 decades now and have already sent thousands of Filipino workers to Canada. No other immigration consulting firm for Canada Immigration can come close to our track records. Looking for an Immigration Consultant to help you realize your dream to live and work in Canada? Check us out and see it for yourself. Listent to what our clients have to tell. About 800 clients we assisted (not counting their dependents) received visa for the year 2010 alone. 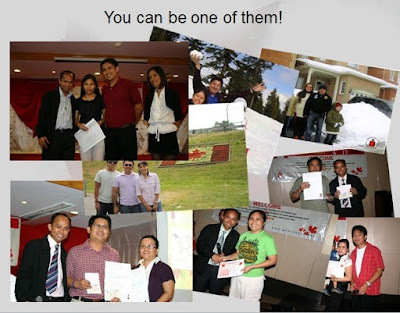 From January 2011 to mid of March 2011, there are already about 70 clients who received visas, some of which will be awarded this March 26, 2011 at Aristocrat Restaurant - Malate, Manila during our Immigrant Visa Party and Seminar. We will be awarding visas to some 25 clients during the event. There would also be an orientation and assessment for those intersted to apply. Reserve a seat now if you are interested to live and work in Canada. Small mistakes cause big problem. Be guided.